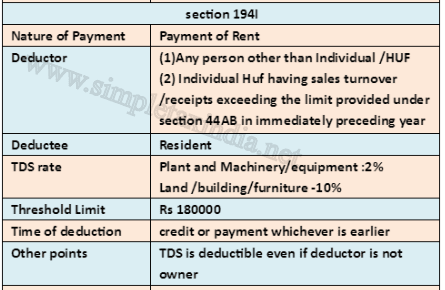 In view of above ,Deduction of Tax at correct rate is very important for deductor and minor mistake in deduction leads to penalty in shape of Interest on late deposit and disallowance of Expenses. 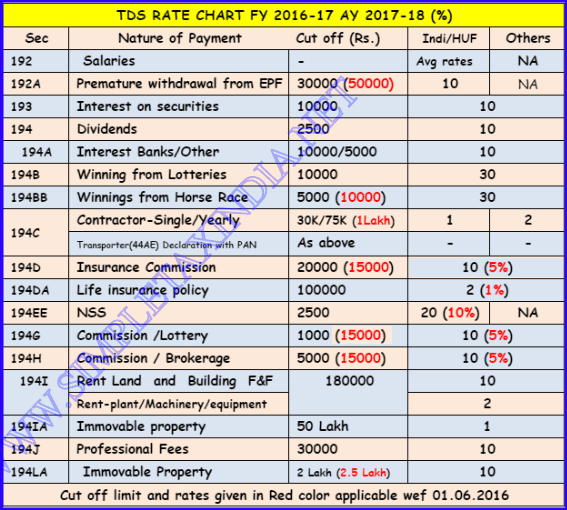 We have Compiled Tax deduction rates chart (TDS rate chart) for Financial year 2016-17 which may be useful for all the readers. 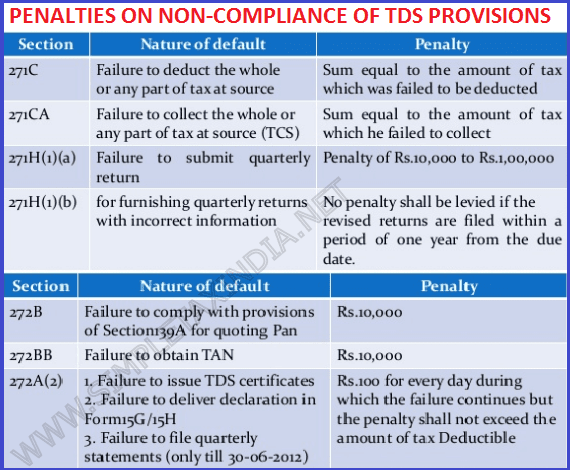 You may also download full post along with other details in PDF from the link given at the end of the post. 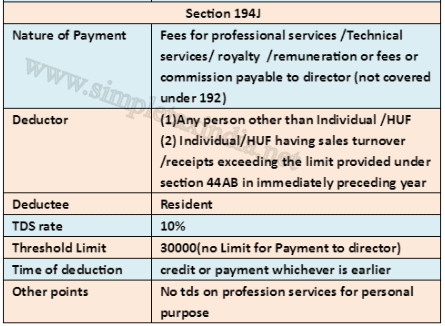 An Individual or a Hindu Undivided Family whose total sales, gross receipts or turnover from business or profession carried on by him does not exceeds the monetary limits (Rs.100,00,000 in case of business & Rs.50,00,000 in case of profession) under Clause (a) or (b) of Sec.44AB during the immediately preceding financial year shall not be liable to deduct tax u/s.194A,194C, 194H, 194I & 194J.So no tax is deductible by HUF/Individual in first year of operations of business even sales/receipt is more than 100/50 Lakh. 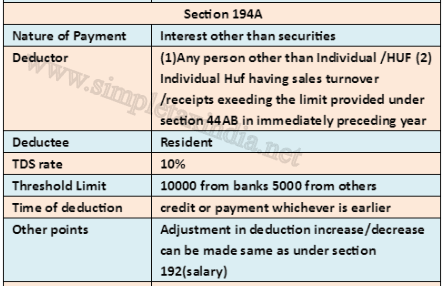 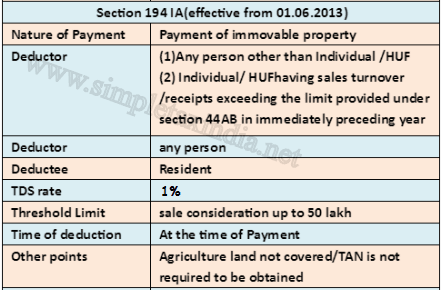 In cases in which tax has to be deducted under sections 193, 194, 194A, 194B,194BB, 194D, 194LBA, 194LBB, 194LBC and 195 of the Income-tax Act, at the rates in force, the deductions shall be made at the rates specified in Part II of the First Schedule and shall be increased by a surcharge, for purposes of the Union, calculated in cases wherever prescribed, in the manner provided therein. 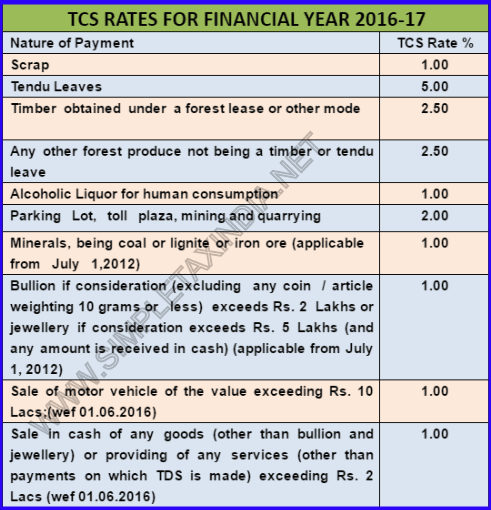 TCS is collectible on Scrap Tendu Leaves, Timber obtained under a forest lease or other mode, Any other forest produce not being a timber or tendu leave ,Alcoholic Liquor for human consumption , Parking Lot, toll plaza, mining and quarrying Minerals, being coal or lignite or iron ore (applicable from July 1,2012) Bullion if consideration (excluding any coin / article weighing 10 grams or less) exceeds Rs. 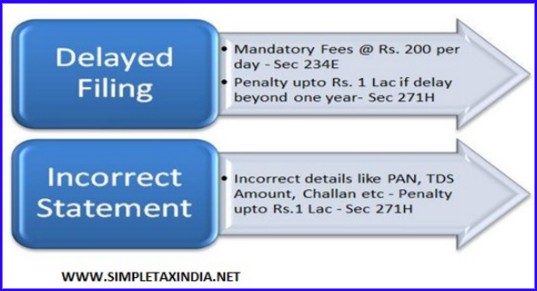 2 Lakhs or jewellery if consideration exceeds Rs. 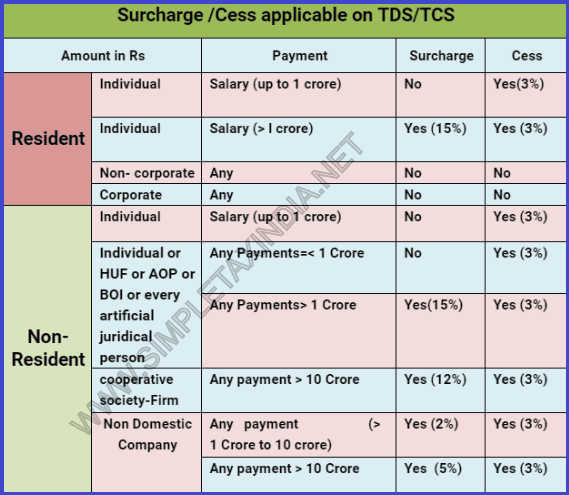 5 Lakhs (and any amount is received in cash) (applicable from July 1, 2012) Sale of motor vehicle of the value exceeding Rs. 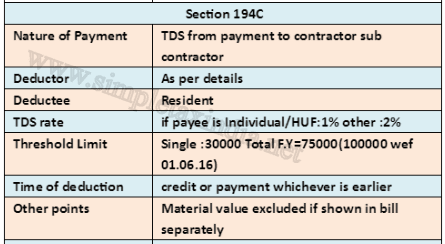 10 Lacs;(wef 01.06.2016) Sale in cash of any goods (other than bullion and jewellery) or providing of any services (other than payments on which TDS is made) exceeding Rs. 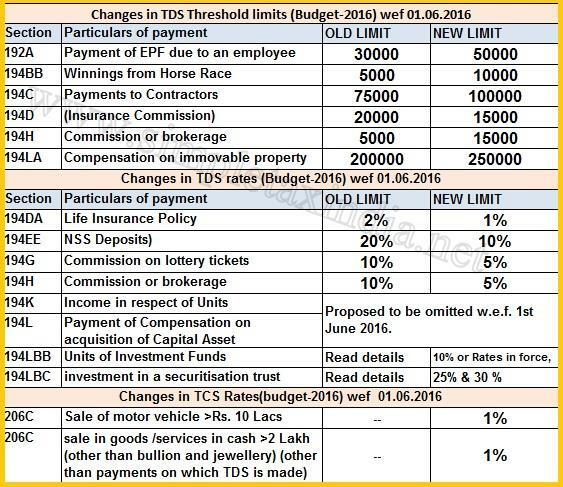 2 Lacs (wef 01.06.2016). 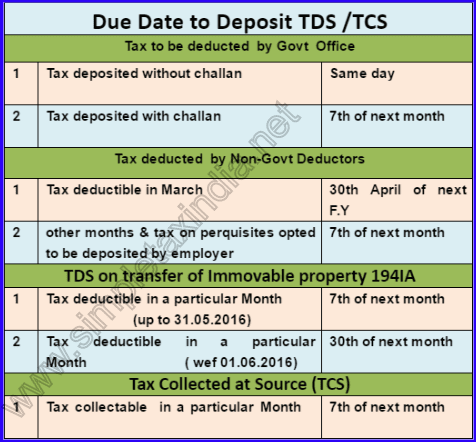 When Tax is to be collected ? 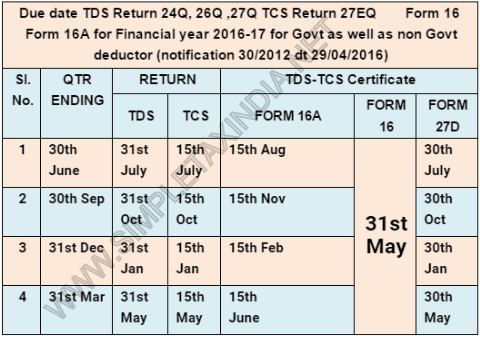 what can i do ITR AY 2014-15 return.